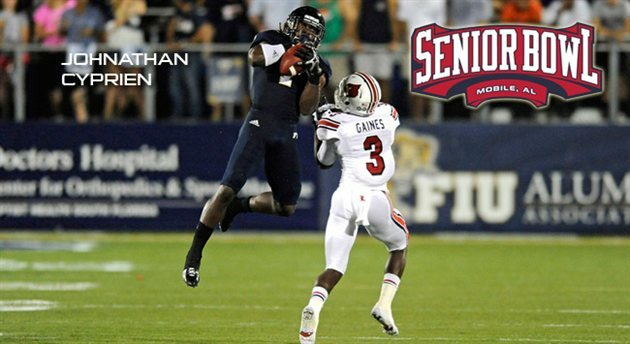 FIU senior strong safety Johnathan Cyprien has been invited to participate in the prestigious Senior Bowl, to be held on Jan. 26, at Ladd-Peebles Stadium in Mobile, Ala.
Cyprien is the second Panther to earn a selection to the premier postseason college football all-star game in as many seasons, but could be the first to play in the game. Former FIU All-American T.Y Hilton was invited to play in the 2011 Senior Bowl, but missed the game due to injury. The North Miami Beach native was named to the All-Sun Belt Conference First-Team on Dec. 5 after a standout senior season for the Panthers. The postseason recognition from the Sun Belt was the fourth in his collegiate career. He was named to the second-team his sophomore and junior seasons and honorable mention as a freshman. Arguably the top safety to ever play at FIU, Cyprien once again led the team in tackles with 93, including FIU highs in solo stops (54) and assisted tackles (39). He also recorded a team-high four interceptions, along with five pass breakups, 3.5 tackles for loss and one forced fumble. He started all 12 games in 2012, as well as every game the past three seasons, and has started the most career games as a safety at FIU (45), which is the third-most amount of starts at any position for a Panther. The Senior Bowl is the nation’s most unique football game and football’s premier pre-draft event, annually featuring the country’s best senior collegiate football stars and top NFL draft prospects on teams representing the North and South which are coached by the entire coaching staffs from two National Football League teams. Senior Bowl practices are also attended by more than 800 general managers, head coaches, assistant coaches, scouts and other front office personnel from the 32 National Football League teams, making Mobile and the Senior Bowl the week-long host to a one-of-a-kind NFL Coaches Convention.